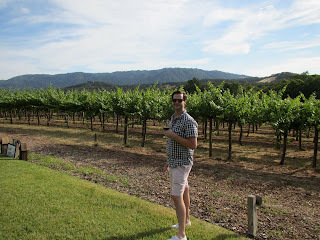 In addition to the Gay Wine Weekend events, I was able to make a few stops at some wineries for a few tastings. We started day one as you always should - with some bubbly! 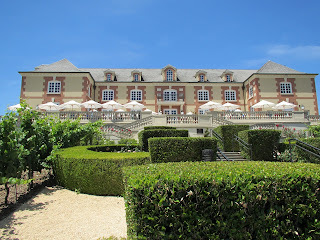 Domaine Carneros is home to some great sparkling wines, and an amazing property. The replica of Chateau de la Marquetterie in Champagne, France sits atop a knoll in Carneros and overlooks amazing scenery of vineyards. 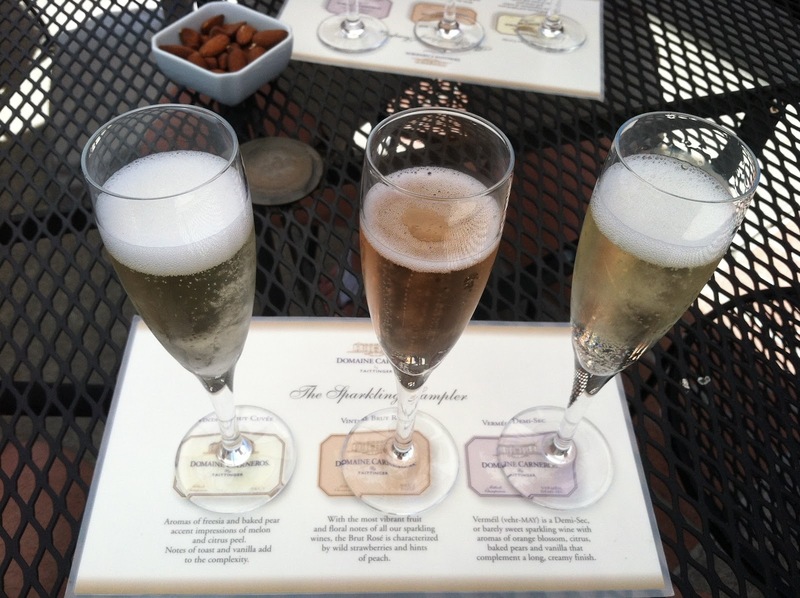 Domaine Carneros was started in 1987 by Champagne Taittinger, a world renowned Champagne house in France. While tasting through the Sparkling Wine offerings, I was struck by the incredible complexity of each of the wines. From the pear and citrus notes of the Brut which lingers with a creamy toasted vanilla finish, to the beautiful strawberries and cream notes in the Rose, and finished the tasting off with the beautifully balanced Ultra Brut, with notes of caramel, apple and a little bit of spice. 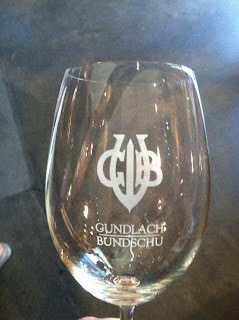 Each of the wines we tasted are exclusive to the winery. 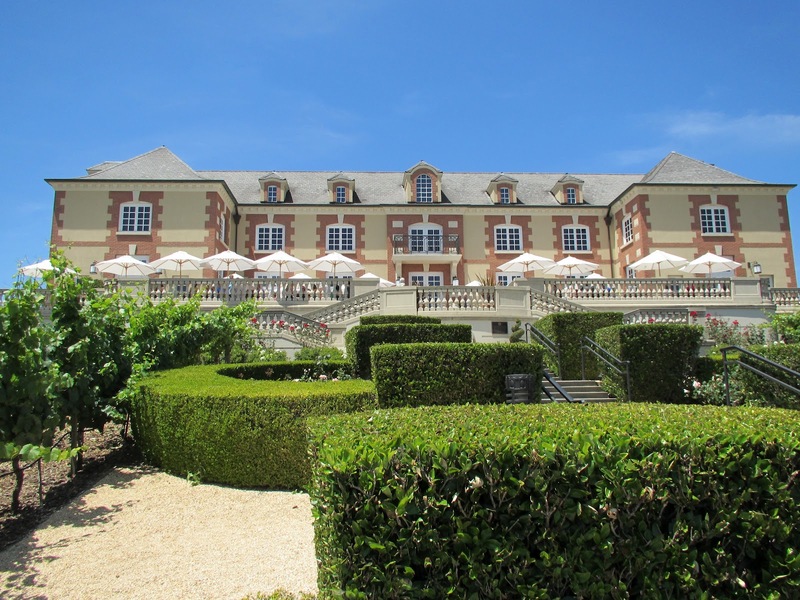 Domaine Carneros does have some distribution, but it mainly consists of the non-vintage versions of each of the wines, which I have also had, and you can't go wrong with them either! 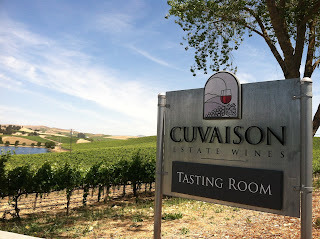 Next stop was across the street at Cuvaison Estate Wines. Known for their beautiful Carneros Chardonnay, as well as their Mount Veeder Cabernet, Cuvaison is consistently producing top tier wines and receiving critical acclaim for their wines. Most recently, Wine & Spirits gave their 2008 Mount Veeder Cab a score of 91 and the 2009 Carneros Pinot Nior a score of 90. Additionally, Wine Advocate scored their flagship Brandlin Cabernet Sauvignon with a 92+. Having tried each of these wine, I would heartily agree with such high praise. Not only are the wines spectacular, but the Carneros tasting room is definitely worth checking out. They also have a Calistoga tasting room, which I haven't had a chance to check out yet. But it is on my short list for the next time I am in town. 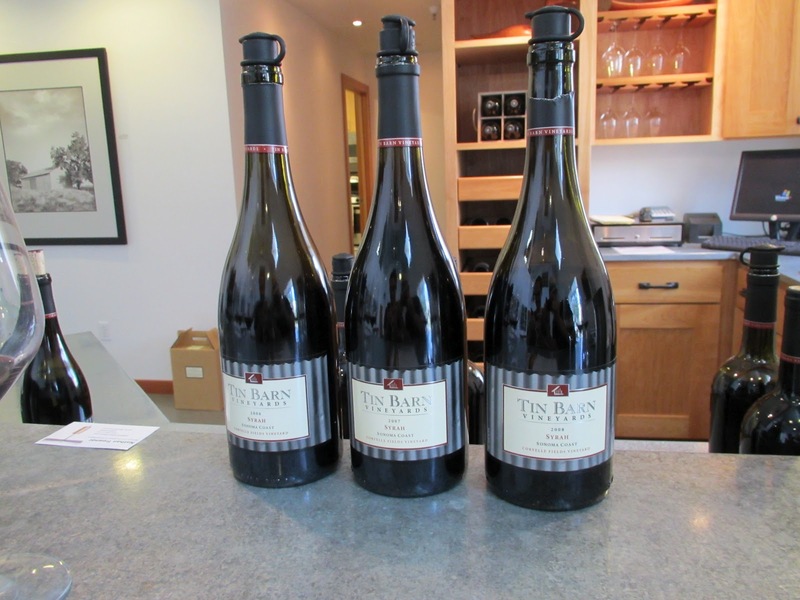 Then on to Tin Barn Vineyards, where they broke my heart as soon as I walked in, when they told me they were out of their Sauvignon Blanc. Temperatures had climbed into the low 100s at that point, and I was looking forward to their incredibly crisp Sauv Blanc that bursts with aromas of citrus and melon. We were however treated to a vertical tasting of their Syrah. As we tasted through the 2006, 2007, and 2008 Syrah, the difference in each of the vintages was pretty surprising. In talking to winemaker Michael Lancaster about those differences, he shared how his wine making style has evolved over the years and also how he approached each vintage differently. If I had to pick out of the three vintages, I would have to say the 2007 was my favorite. The 2007 seems to have reached a point of balance that the 2008 will most likely achieve within the next year. However our favorite of the tasting had to be the 2009 Los Chamizal Vineyard Zinfandel. Bringing together the perfect balance of sun ripened cherries and a toasted oak finish, this Zin is a can't miss for any summer BBQ. Finally we headed to Gundlach Bundschu (see pronunciation in the cleaver logo below). This amazing property, set at the base of the Mayacamas Mountains which separate the Napa and Sonoma Vallies, has been home to the Bundschu family for six generations. While all of the wines impressed, the unique Tempranillo Rosé and the Tempranillo had to be my two favorites. This European-style rosé offers aromas of tangerine, freshly-picked peach, and strawberry with crisp flavors of wild red raspberries, kiwi fruit and hibiscus tea. The Tempranillo, according to Gun Bun's website, has intense aromas and flavors of blackberry and mission figs, with layers of dark cocoa, fresh tobacco leaf and black pepper. From there we headed to the El Dorado Hotel to check in for the weekend. El Dorado is quaint little boutique hotel, with only 25 rooms or so. The rooms are very comfortable, and all give a different view of the Somona Square and surrounding area. In addition to the hotel, El Dorado Kitchen has some amazing food. Check out the sliders! That night brought the Twilight T-Dance at Atwood Ranch, for Gay Wine Weekend! Check out this post for more on that. To say that the 2nd Annual Gay Wine Weekend organized by Out in the Vineyard, was a smashing success, would be an understatement! Sonoma opened its doors to over 300 visitors for three days of events, and those in attendance could not have felt more welcome. Wineries, restaurants, hotels and shops all across Wine Country showed such gracious hospitality, it is no wonder members of the LGBT and allied communities are flocking to participate in Gay Wine Weekend. Having grown from the Twilight T-Dance, into three days of tours, winemaker's dinners, a cabaret night, and a Big Gay Wine Auction and Recovery Brunch, there is something for everyone. I have said it before - Mark and Gary of Out in the Vineyard, really know how to put on an event. Once again, the setting, weather and sunset at the Twilight T-Dance, could not have been more perfect. 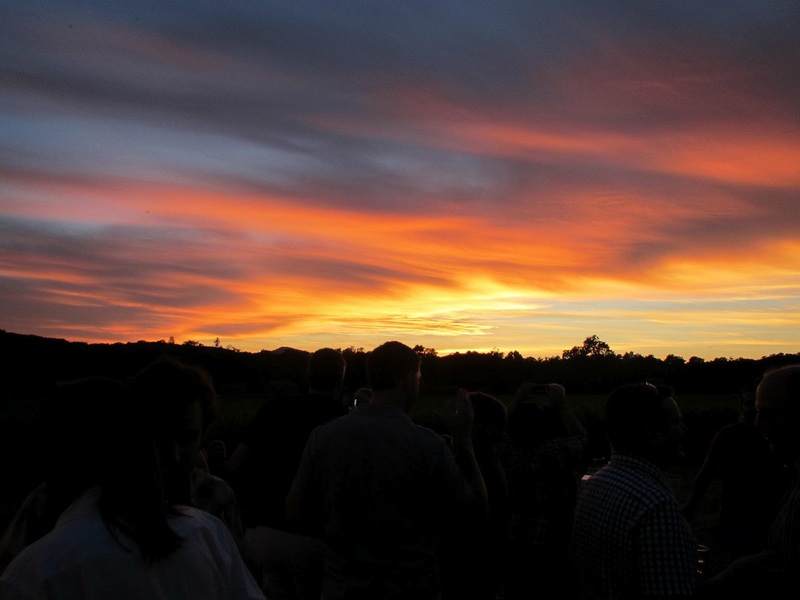 As over 400 guest at Atwood Ranch danced the night away to New York DJ Corey Craig, the breathtaking sunset over the Sonoma Valley painted the perfect backdrop for a night Out in the Vineyard. The dance floor is filling up as DJ Corey Craig spins the latest dance hits. The sunset could not have been more breath taking! Not only was the weekend about having a great time, eating amazing food, and drinking world class wines. It was also about doing good, and giving back to the community. Proceeds of the events benefit Face to Face, Sonoma County AIDS Network, and this year, at the Big Gay Wine Auction alone, approximately $14,000 was raised. Auction lots included wines from all over Wine Country, overnight stays at wineries, day trips and tours and even a winemaker dinner with world renowned winemaker Mark Lyon of Sabastiani Wines. The final tally is still coming in, but Out in the Vineyard projects to have raised $18,000-$20,000 for Face to Face. As Rick Dean, Executive Director of Face to Face pointed out at the auction, funding for agencies like Face to Face is scarce, so to raise nearly $20,000 in a weekend ensures they are able to continue to provide essential services to those in Sonoma County. Be sure to mark your calendars for June 14-16, 2013. 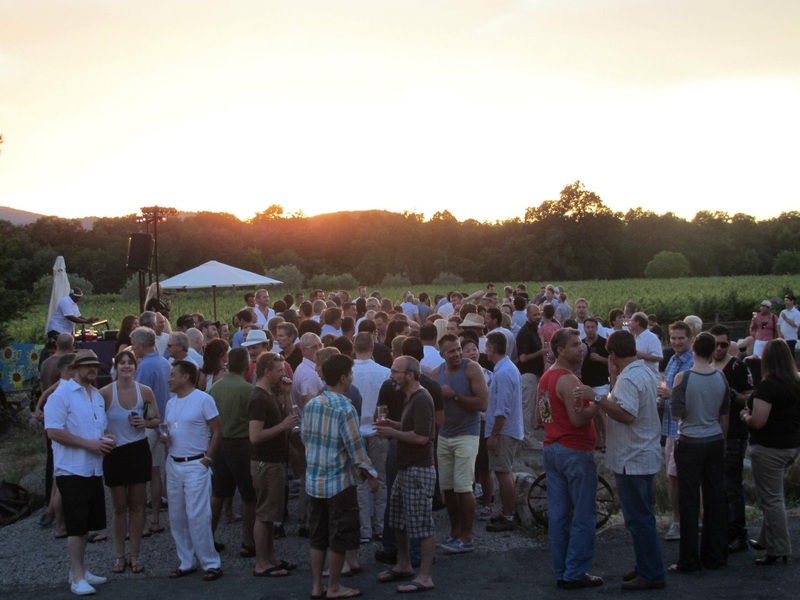 The 3rd Annual Gay Wine Weekend is bound to be the can't miss event of the summer! Two of my favorite things come together at Sutra Midtown in Phoenix as they present YogaVin. A unique Sutra creation that blends the rich spoils of a flowing, breath-synchronized yoga class with the tantalizing and vibrant flavors of premium wines. I mean really, what sounds better than that? YogaVin starts with a meditative, candlelit flow class, designed to unwind your mind and vibrate your soul, and Sutra Midtown's yoga instructors have the ability to do that like no other yoga studio I have gone to. Then to top it off, immediately following your yoga session, you enjoy selections of savory wines and enticing appetizers. An evening centered on balance, both in our lives and on the mat, celebrating the riches of life. The next YogaVin is next week! June 15th from 7:00pm - 9:00pm. Sutra Midtown is located at: 2317 North 7th Street, in Phoenix. Call Matt and Rebecca for more information - (602) 253-9525, or check out www.sutramidtown.com for more information! And don't worry, if you can't make it this time, this is a regular event, so sign up for their newsletter to stay on top of everything they have going on. Also, join them on facebook and twitter. On this tasty edition of “Queers!”, we raise our glasses to our newest official member of the clan, Meschelle Hornstein! She has been a guest for several episodes and she decided to officially fill the 4th host spot that was Libbie Miller once held. Speaking of Libbie, check out her recent presentation at Ignite Phoenix, all about her journey to becoming a Wino! Interview with Out in the Vineyard about the upcoming Gay Wine Weekend in California’s Sonoma Valley June 15-17. Congrats to Meschelle for recently graduating from Le Cordon Bleu in Scottsdale! She tell us all about her culinary school experience. Claudine talks up Baratin, a new restaurant that just opened in Scottsdale from the culinary minds at FnB. Joe chats about summer’s favorite food to keep you cool: ice cream! Where did ice cream come from? He relates some fun facts about this sweet treat and previews his upcoming review of Sweet Republic Ice Cream in Scottsdale. Gay Wine Weekend kicks off Friday, June 15th, with a VIP Reception at the host hotel, El Dorado Hotel. Following the reception, there are three different winemakers dinners - two of which are already sold out. The events continue on Saturday, with three different wine tours to choose from. Followed by the premier event of the weekend - The Twilight T-Dance at Atwood Ranch, under the stars and "Out in the Vineyard". Followed by "Apres-T" After Party at El Dorado Hotel. The weekend wraps up on Sunday morning with the Big Gay Wine Auction and Recovery Brunch at Ramekins's Culinary School & Inn, located just blocks from the town square of Sonoma. This will benefit Face to Face, Sonoma County AIDS Network. 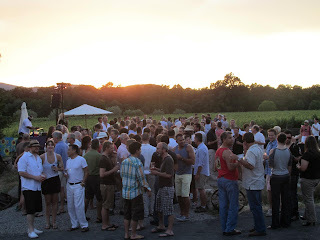 For more details on Out's in the Vineyard's Gay Wine Weekend, visit www.outinthevineyard.com. Queers! #9: Gourmet Pride Festival Food Mashup! We’re sad to report that Libbie has retired her microphone and will only be joining us on ‘special occasions’. No, it wasn’t personal, she still loves us! On this edition of “Queers!”, special guest Meschelle Hornstein returns. Oh my , could she become a regular? Only time will tell. As usual, we forgot to intro ourselves, but you’ll figure it out by the end of the show (or see our page info on QTalkAZ.com). The wine featured on this episode is Four Bears USA Sean Minor 2010 Sauvignon Blanc from Sonoma County. And it’s quite fruity and a perfect summer wine! Thank you Nathan for supplying the vino! Also speaking of summer, since we have seemed to skip spring once again, it’s time to talk citrus. Joe explains where citrus came from, what you can really do with a lemon and what comes to our minds with we think of that yellow tangy fruit! Claudine talks to us about the Fry Bread House, a hole-in-the-wall place that was nominated for a James Beard Award! Quite a variety of, well, fry bread choices on the menu that should appeal to just about anyone–even our vegan guest Meschelle! 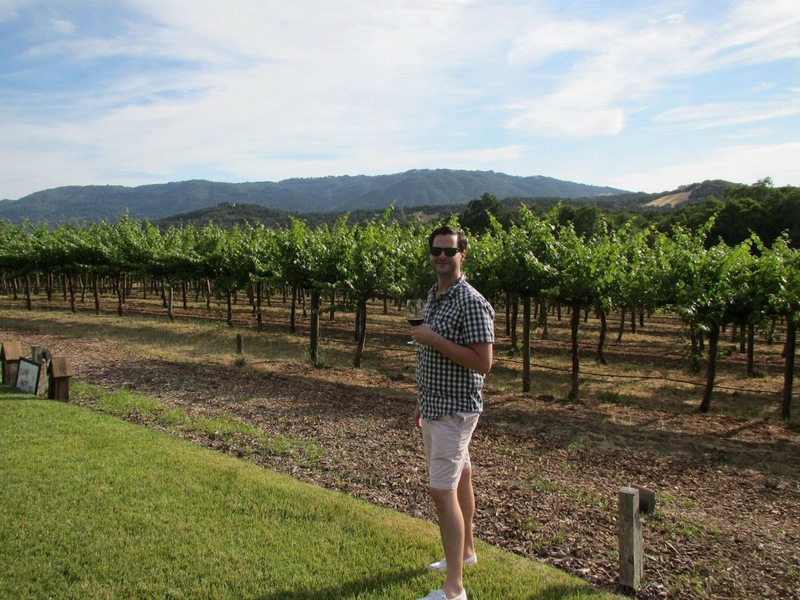 Nathan talks to us about his recent experience on the Big Gay Wine Train in Napa Valley and the upcoming Gay Wine Weekend in June. For detailed info and a great interview with the event producers, check out this archived episode of Queers! And to wrap it up, it’s Pride Season! Phoenix Pride is this weekend and we hope to see all of you at our booth!! Come enter to win a Lytro camera, but most of all, just come and hang out with us and check out some of our live video broadcasts that we’ll do from Pride! We’ve got a parade entry and live commentary and, way too much going on. Check our Facebook pages and the QTalk AZ home page for more details! BUT, how can you make ‘pride festival’ food fabulous? Can the non-gourmet be turned gourmet? And yes, oh dear, we’ve got an answer to that very question! Shoot us an email at queers@qtalkaz.com to suggest show topics, new dives that we should check out, wine you enjoy or just give us a shout-out! Or you can leave us a voicemail at (888) 791-9294. See you at Phoenix Pride!